Christian Calcano defeated Alexander Hayne in a three-game finals to become champion of Grand Prix Atlantic City. Using his powerful White-Black deck to defeat No. 24-ranked Alexander Hayne in the finals, Calcano marched through his Top 8 competition with speedy aggression and late game dominance of Mastery of the Unseen. Using his combination of fast creatures and tricks backed up by the Constructed-powerhouse enchantment gave Calcano the edge he needed for draft victory. Grand Prix Atlantic City was full of other talented competitors. 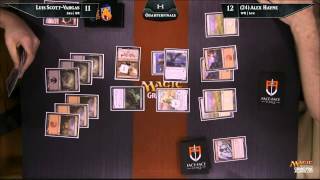 With strong showings from Pro Tour Hall of Fame member Luis Scott-Vargas and No. 14-ranked Jacob Wilson to boot, the depth and breadth of Dragons of Tarkir was put to its first test this month. Powerful archetypes like Blue-Black were dominant when successful, but often fell to the efficient power of Red-Green and White-Blue when things didn’t come together. Fate Reforged continued to show it’s affect on things, namely powerhouse rares like Citadel Siege continuing to prove potent in Limited, but the multicolor heyday of the previous Limited format had given way to two-color creations. There were plenty of lessons about Dragons of Tarkir shared this weekend, but Calcano lived up to the “Do AC” motto as he did the greatest anyone here could. Congratulations again to Christian Calcano, champion of Grand Prix Atlantic City! Grand Prix Atlantic City is in full swing, with 202 players returning for the Sunday Dragons of Tarkir/Fate Reforged Draft showdown for Top 8. 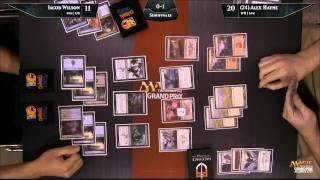 Through the Day 1 Sealed Deck adventure rose seven undefeated players – No. 19-ranked Andrew Cuneo, Stephen Neal, Chris Fennell, Hugh Kramer, Jeff Green, Eli Kaplan, and Matthew Bartley – with many more right behind them, such as Pro Tour Hall of Fame member Jon Finkel, Christian Calcano, Ben Friedman, David Ochoa, and No. 14-ranked Jacob Wilson. It’s an impressive mix of competitors ready to break through and make their claim at Grand Prix victory. 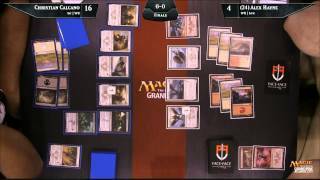 Six rounds of Dragons of Tarkir/Fate Reforged Draft stand between us and the Top 8. Follow along all day long on twitch.tv/magic2 for live coverage with Marshall Sutcliffe, Jacob Van Lunen, and Brian David-Marshall from here in Atlantic City. What started with 1615 players opening 6460 packs of Dragons of Tarkir and 3230 packs of Fate Reforged for Sealed Deck has left us with just 202 players returning for Sunday here in Atlantic City. Through the Day 1standings rose seven undefeated players – No. 19-ranked Andrew Cuneo, Stephen Neal, Chris Fennell, Hugh Kramer, Jeff Green, Eli Kaplan, and Matthew Bartley – with many more right behind them, such as Pro Tour Hall of Fame member Jon Finkel, Christian Calcano, Ben Friedman, David Ochoa, and No. 14-ranked Jacob Wilson. It’s an impressive mix of competitors ready to break through and make their claim at Grand Prix victory. With six rounds of Dragons of Tarkir/Fate Reforged Draft standing between us and the Top 8, Sunday promises to be filled with the best putting Dragons and more through their paces. Join us at 9:30 AM ET (6:30 AM PT; 12:30 PM CEST) on twitch.tv/magic2 for live coverage all day long until another champion is hatched. The hashtag for Grand Prix Atlantic City is #gpatcity. Join the conversation! Due to shipping issues with the Grand Prix video equipment, the live video coverage of Grand Prix Atlantic City will be delayed.